In observance and support of the State Funeral for former President George H.W. Bush, Mayor Bowser has activated the District’s Emergency Operations Center (EOC) to ensure district services are well-coordinated within Washington, DC during the three-day event. 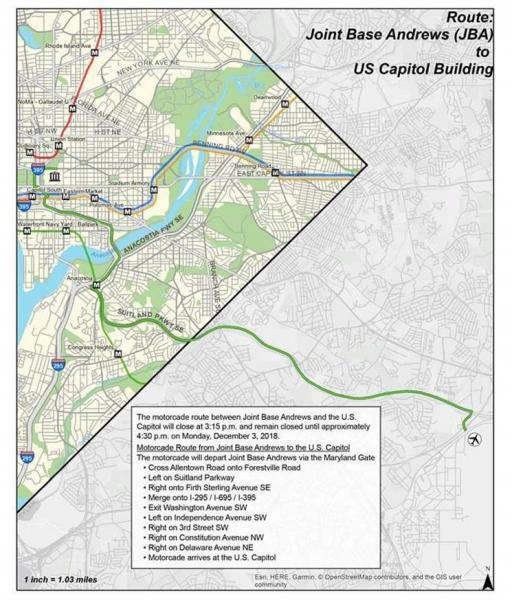 To see full maps, please visit: dc.gov/Bush. On Wednesday, December 5, District Government and District of Columbia Public Schools (DCPS) will be open and operate on normal schedules. Residents are strongly encouraged to take the Metro and other forms of public transportation as the District will experience significant traffic delays beginning the afternoon of Monday, December 3, through the evening of Wednesday, December 5, due to processional routes and road closures. The Department of Public Works will clean all funeral processional routes. The District Department of Transportation is posting flags along the routes. The District’s EOC and Joint Information Center (JIC) will be operational through the evening of Wednesday, December 5. Residents and motorists can register to receive important alerts from the District on their devices by signing up for AlertDC at alertdc.dc.gov or call 311 for additional information. District Government and federal partners have updated transportation plans for the State Funeral. While these closures are in effect, expect traffic delays and closures of side streets. Motorists are reminded to proceed with caution in and around event locations as increased pedestrian traffic is anticipated. All street closures and listed times are subject to change, based upon prevailing or unexpected conditions. The following map demonstrates the above parking restrictions. 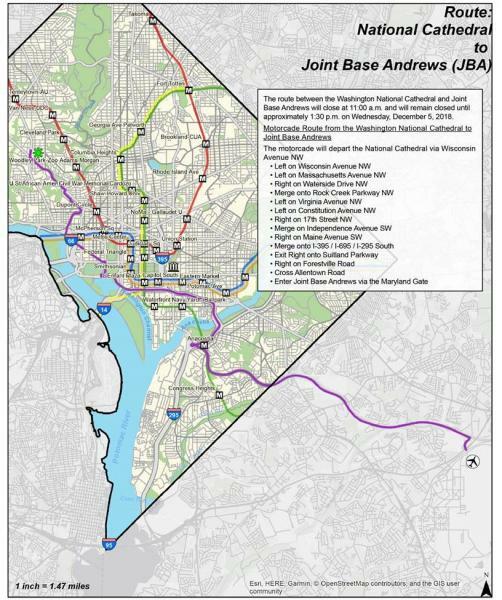 The below route between Joint Base Andrews and the U.S. Capitol will close at 3:15 p.m. and remain closed until approximately 4:30 p.m. on Monday, December 3, 2018. The following map demonstrates the above route. 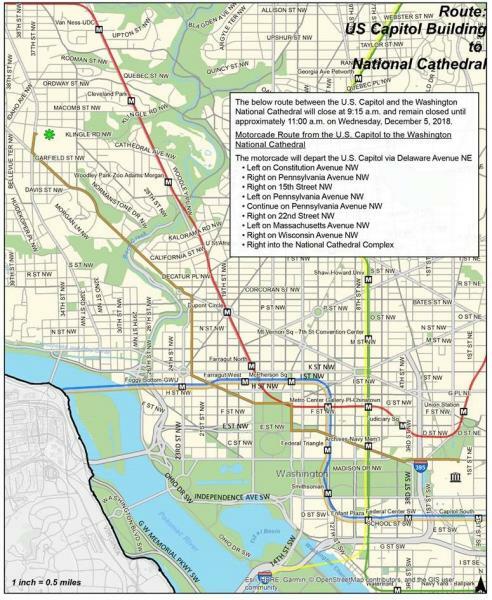 The below route between the U.S. Capitol and the Washington National Cathedral will close at 9:15 a.m. and remain closed until approximately 11:00 a.m. on Wednesday, December 5, 2018. The route between the Washington National Cathedral and Joint Base Andrews will close at 11:00 a.m. and will remain closed until approximately 1:30 p.m. on Wednesday, December 5, 2018. The public should expect parking restrictions along the streets listed below and should be guided by the posted emergency no parking signage. All vehicles that are parked in violation of the emergency no parking signs will be ticketed and towed. The maps presented on this release are available at dc.gov/Bush.